Sometimes I have to remind myself that not everyone is as confident in the great outdoors as I am. The fact that I wouldn’t think twice about taking the kids camping is, understandably, an alien notion to some. One of the most beautiful things about we humans is our diversity and, of course, this diversity extends to our interests and competencies. So, how can parents who feel a little uncomfortable with family camping dip their toe into the water in a way that is safe, convenient and comfortable? Host a garden party, of course. 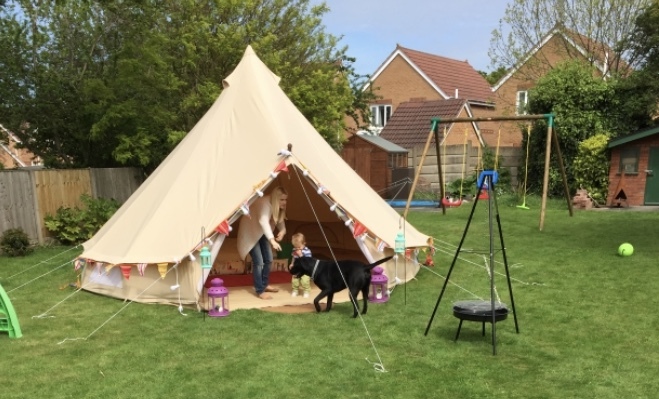 There are few simpler ways to get kids outside than pitching a tent in your garden. If this is their first camping experience, however, you’ll want to make it as fun and exciting as possible. Obviously, there are still some basics that you’ll need to understand and master. Having a tent for starters and being able to pitch it. Even if you don’t own one, ask friends and family. There is always someone willing to lend you a tent, believe me. Now all you need to do is check the forecast. Check it 3 days before you intend to host your garden party camping extravaganza; check it again the day before and then once more on the morning of the event. The last thing you want is a sudden influx of truly torrential rain dampening your spirits, or high winds scaring the kids into never wanting to camp again. Camping garden parties can always be rearranged! Our beloved family bell tent. On the day of the camping garden party, get the kids involved in pitching the tent. Even our 4-year-old helps us by following me around with the pegs and passing me the mallet. Once the tent is up he also loves to arrange his own sleeping area by laying out his own sleeping bag. The more involved they feel, the more exciting the experience. The next thing you’ll want to do is make sure you’re warm. Remember to insulate above and below the body. So much heat is lost through the tent floor so a cheap inflatable mattress, SIM (self-inflating mattress, or even a good duvet can help keep little bodies warm when the temperature drops. As you’re in the garden, chuck in a load of pillows, duvets and blankets from the house. The more the merrier. It’ll help give it that kid’s den sort of feel. Lastly, you want to have some fun. Unless we’re wild camping, we always take our group shelter away with us. Even our massive 5m bell tent can seem like a pretty small space if we’re required to spend hours on end inside it. As such, something like an event shelter or a gazebo can be used as a garden camping party tent and will provide you with an additional outdoor communal space to gather. This will enable you to stay out for as long possible and resist the temptation to retreat back indoors. An event shelter (like ours) or a gazebo can create a great communal space when family camping whether you’re in the garden or on a campsite. Furthermore, if you have little ones, like us, little play tents and teepees are available from lots of places. Fill one with colouring books, teddies or even turn one into a garden party ball pit. Have a BBQ or use a fire pit or chimenea to safely light a campfire and toast marshmallows with the kids. Stay up late, watch the stars, look for the International Space Station, sing songs and generally just have an awesome, awesome time. The message here is, that if you’ve never been camping before, you don’t have to rush off to the other side of the country to introduce yourselves to the outdoors. With a bit of forward planning, a garden party can be a great introduction to camping in a tent. Once you’ve made those great memories, host more regular garden parties for the kids and consider nearby campsites. 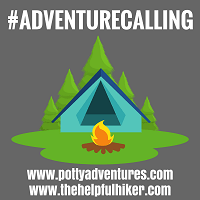 As ever, if you’ve got any questions on the subject of camping with kids, just message us. I love your family bell tent, we’d love to have one. My boys love the outdoors so much and would be fun to have even a garden camping party.